What Does Russia Know About Gold That We Don't? Home » What Does Russia Know That We Don’t? What Does Russia Know That We Don’t? It didn’t take long for Vladimir Putin to resume stockpiling gold. Why is he buying in such massive quantities? We offer three likely reasons. Even though their economy is in recession and its people are hurting, Russia is buying gold – and lots of it. The Kremlin took a brief, two-month hiatus from its buying frenzy earlier in the year, when the ruble took a hit. But today, Moscow is yet again backing up the truck for the precious metal. “According to the International Monetary Fund, the Kremlin in March bought gold in the largest quantities seen since last September, when president Vladimir Putin’s dispute with the West over Ukraine was beginning to heat up, leading to the near collapse of the rouble against the US dollar. Okay, so we know Russia is buying a massive sum of gold. It begs the simple question: Why? There are several possible reasons for Russia’s spree. Russia has a lot of wealth. Even though they have used their currency reserves to defend the ruble over the last year, the Kremlin still has between $300 and $400 billion in reserves. But with many saying that the U.S. dollar is overvalued, and with the euro not inspiring much confidence, Russia needs somewhere else to park its assets. Gold is the natural choice. The precious metal has been a store of value for thousands of years. Buying lots of gold is a responsible decision to hedge against the debt problems of developed nations. In light of the West’s ability to inflict economic pain on his country, Vladimir Putin would like nothing more than to assert economic strength over the United States. He is looking to move from the role of servant to master. So, slowly and carefully, Russia (and China) are looking to de-dollarize and build economic might. If Putin can guide Russia out of recession, and if the price of crude oil were to rise, then Putin could potentially turn the tables on the United States and use America’s economic weakness against her. Currently, Russia’s currency is at the mercy of international market forces. 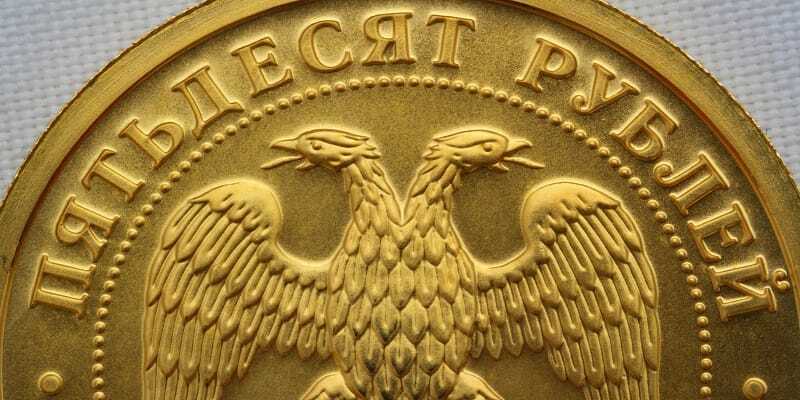 However, if the U.S. Dollar loses reserve currency status in the future, the ruble, backed by huge hydrocarbon resources and gold, could be on the rise. So while Russia may currently be marginalized in today’s global economy, Vladimir Putin is not sitting on his hands. To get ready for a day when the tables may be turned, he is buying gold – quite likely for all the reasons listed here, and more. It acts as a huge economic weapon to his geopolitical quiver that he may be able to use one day. Just as Vladimir Putin seeks greater diversification and economic strength with gold, so can you. If you don’t already own some – even if just as part of your savings – now is as good a time as any. Give us a call. If you’re on Tumblr, you’ll want to follow our profile here.